Ben is an Australian from the Barrossa who moved to South Africa 5 years ago. He took over winemaking at Longridge recently, the 1998 vintage being the first under his control. His immediate plan is to consolidate his portfolio of wines and raise quality wherever possible – principally in the vineyard, where Ben sees scope for delivering better quality fruit. The wines are marketed in three teirs, the Capelands range is made from bought-in fruit and is their entry level label, priced at around £4($7) retail. Around 10,000 cases of each varietal are produced. 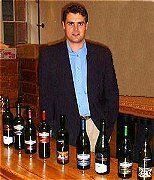 Ben Radford is winemaker at Longridge, a very good estate in Stellenbosch, South Africa. Ben was in Glasgow to present almost the full range of his wines along with his main Scottish retail outlet, Peckhams – one of Scotland’s best food and wine specialists. UK merchant Oddbins also carries a small selection from the range. The Bay View range is priced a pound or so higher and sees around 30% new wood in some bottlings. Top of the range wines are simply labelled Longridge and retail for £10-£12 pounds ($16-$19). These are almost exclusively single-vineyard wines which have spent some time in 100% new French oak. A couple of thousand cases are produced. I found the Capelands bottlings offered great value for money: juicy, nicely balanced wines with plenty of character for the price, stylishly packaged too. The Bay View selection didn’t all work for me, though again the pricing is fair. The two wines from the Longridge range (which I’d tasted before) were lovely, and in a different league in terms of fruit quality and depth. In all a promising range striking a balance between commercial fruitiness and more serious structure. Very easy, approachable, peachy Chardonnay with nutty softness and a palate that’s silky and sweetly-fruited. There’s a nicebalance through crisp lime acidity, and a decent finish let down only by a little rawness. At the price, very good indeed. The nose is more yeasty with some oak and more apple-like fruit. On the palate it is a little richer than the Capelands, with more body. The fruit is fairly lean, though purer into the finish. This is a wine that really needs food. Really quite Burgundian, with a toasty, charry nose of vanillin French oak. It is leesy and rich, the fruit beneath emerging shyly, but when it does it is pure, fresh and peachy. The palate has good balance. There is good, cool, classy citrus and peach fruit and fine lime acidity. My second tasting of this wine confirms that though delicious now, leaving it for a year or so should allow the oak to subside and fruit emerge. Beautifully sweet, aromatic nose of peach-skins, flowers and tropical fruit: mango and lychee notes, even hints of coconut. It is full and round on the palate, though with a refreshing citrussy sharpness to the fruit and a green apple acidity that cuts through leaving the finish dry and moreish. Very nice stuff. There’s a slightly dank, vegetal quality to the fruit at first, but a nice blackcurrant and red berry quality begins to dominate. On the palate it is very easy to drink, the fruit is simple and forward yet there’s enough tannin to keep it fresh and food-friendly. Good. This has that tinned Italian tomato quality to the nose that I dislike in some Merlots. It’s an odd melange of sickly-sweetness and a dull, metallic quality. Past that there is some red berry fruit, but it is surprisingly firm on the palate. I find this a little green and astringent. Tannins coat the mouth, and the fruit doesn’t appear to have the quality to stand up them. The weakest wine in the range. Quite an earthy character on the nose. There is subtle, sweet, toasty oak and some spice that sharpens the profile. The palate has good fruit, quite juicy, if rather lean and a touch green. This is grippy too, with firm tannins and noticeable acidity. Good length and a pretty good Pinotage. Lots of sweet blackcurrant, almost menthol fruit on the nose. There’s a lighter, sharper raspberry edge too. Oak is there, but in the background. On the palate it has a creamy texture and the fruit is really quite dense. A clean style, this would be ideal with some lamb or beef. It is balanced, with moderate tannins and acidity and decent length. Good. Second barrel sample I’ve tasted of this impressive Merlot. Dense, chocolate and plummy depth to the fruit: much more character and a much better wine than the Bay View. Lovely concentrated mulberry and spice with fine length. Delicious. This will be bottled soon and should be in export markets early in 2000.